Established in London, the London Court of International Arbitration (“LCIA”) is one of most prominent arbitral institutions, which provides services for arbitration, mediation and other ADR proceedings, with a current average of 303 cases per year. The LCIA is composed of three separate structures: the Secretariat, the Court and the Company. The Secretariat is the only permanent organ. It is responsible for carrying out the day-to-day management of arbitral proceedings. The Registrar is the highest authority of the Secretariat, which is assisted by the Deputy Registrar. The Court supervises the Secretariat’s activities. Thirty-five members, who serve a five year mandate, compose the LCIA Court. Its main responsibilities are: acting as an appointing authority, determining challenges to arbitrators, and controlling costs. The Court also has the final word on interpreting provisions of the LCIA Rules, when they are in question. The Company is the only organ that does not provide administrative services. It is in charge of supervising the LCIA’s activities and development, according to the applicable law. The LCIA provides services for arbitration, mediation, adjudication and ADR. It is important to note that the institution does not itself resolve disputes. Rather, it provides the necessary support for parties and for the arbitral tribunal throughout the proceedings. Parties may also resort to the LCIA in ad hoc proceedings. In this case, the institution will act as an appointing authority, and it will assist the parties in the appointment of arbitrators, mediators and experts. other fees (such as fees of cancellation or for a memorandum of correction). an additional fee of 5% of the total arbitral tribunal fees. The Court’s and the Secretariat’s services are charged on an hourly based system. This means that the cost will be based upon the actual time spent working with respect to a given arbitral proceeding. This is intended to ensure that simple disputes involving a large amount in dispute will not cost more than similar disputes with a smaller sum, unlike the rules of other institutions, where fees are calculated based on the amount in dispute. 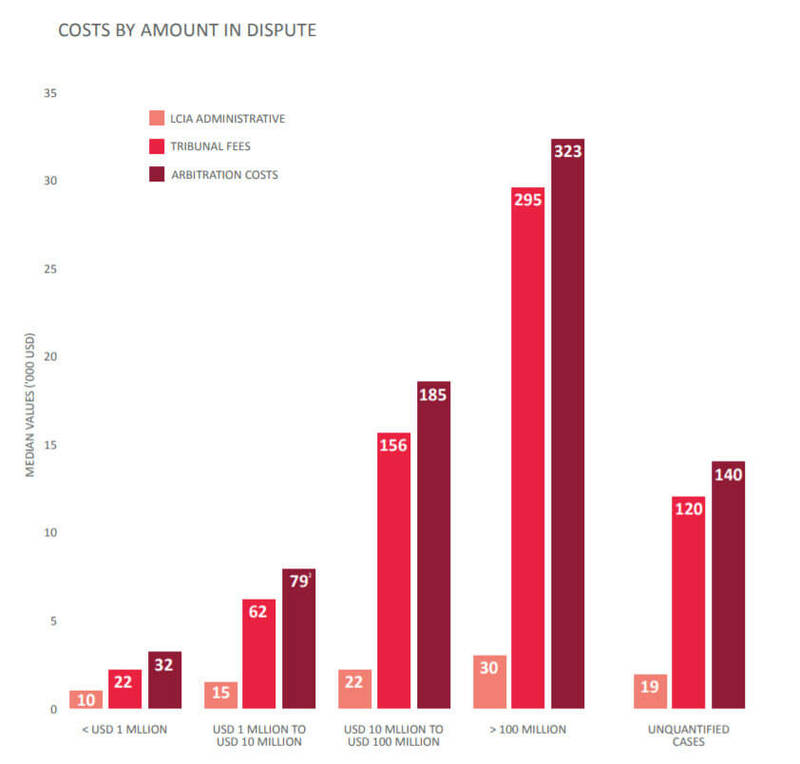 Although it is difficult to know how much a given LCIA arbitration will cost at the outset, the chart below shows statistics regarding the average costs involved, absent legal fees and expert fees. While the average LCIA arbitration lasts 16 months and costs USD 97,000, cases where the amount in dispute is over USD 100 million should be expected to cost many hundreds of thousands of USD. The report also shows that the median time for an arbitrator to issue an award is three months. Typically, parties refer to LCIA arbitration or its Rules in arbitration clauses drafted prior to a dispute arising. This allows them to commence proceedings in the event of a dispute, rather than resorting to domestic courts. However, parties may also agree to resort to arbitration after a dispute has arisen, in a separate agreement, although this is often difficult as a practical matter. Under the LCIA Rules, arbitral awards are final and binding. They also provide for waiver of the right to appeal, as long as this is admissible under the applicable law, ensuring that businesses will not spend years on appellate litigation.